Today I'm updating this page with a random selection of what I'm calling the "touchstone years." 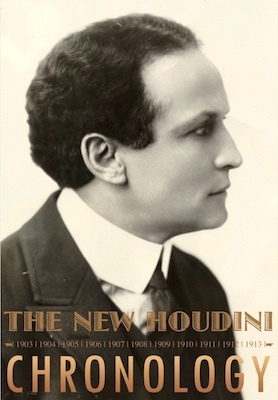 These are years that are especially significant in terms of Houdini's life and career. I've also included my "A.D." page that tracks the amazing afterlife of Houdini from 1927 to the present. As always, your comments and contributions are welcome. I hope you enjoy this latest peek inside The New Houdini Chronology. 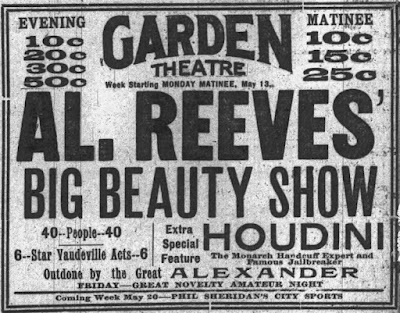 In doing The New Houdini Chronology I rely a lot on old newspaper ads that provide many dates and places where Houdini appeared. But I've learned I have to be careful. Below is an ad for what appears to be Houdini at the Garden Theater in Buffalo during the week of May 11, 1907. I had even added this to the chronology. But then I had a closer look. This is actually an appearance by The Great Alexander (presumably not the Alexander). But the placement of the text and the wording deliberately encourages a misreading that this is Houdini himself. And this isn't the only example of deceptive billing that I've come across. I've also noticed some who have attempted chronologies before me have have fallen victim to one of these tricky Houdini imitators. One of Houdini's most famous stunts was his suspended straitjacket escape. This iconic escape actually arrived relatively late in Houdini's career (1915). I've so far been able to document over 50 performances of the suspended straitjacket across the United States and Canada. Did your town make the list? Sept. 8, 1915: Kansas City Post Building in Kansas City, MO. Sept. 29, 1915: 4th St. between Nicollet & Marquette Ave. in Minneapolis. Oct. 19, 1915: Seattle Times Building at 2nd Ave and Union St. in Seattle, WA. Oct. 25, 1915: Oregonian Building in Portland, OR. Nov. 23, 1915: First National Bank Building at Broadway & 14th in Oakland, CA. Nov. ?, 1915: Los Angeles, CA (unverified). Dec. 22, 1915: Walker Bank Building at 2nd South & Main in Salt Lake City. Dec. 30, 1915: Denver Post Building at 1577 Champa St. in Denver, CO.
Jan. 13, 1916: Star-Telegram Building at Throckmorton & 8th St. in Fort Worth, TX. Jan. 18, 1916: Dallas News Building at Commerce & Lamar St. in Dallas, TX. Jan. 25, 1916: Houston Chronicle Building in Houston, TX. Feb. 2, 1916: Express Building at Navarro & Crocket St. in San Antonio, TX. Feb. 10, 1916: Littlefield Building at 6th & Congress in Austin, TX. Feb. 23, 1916: The Daily States Building on Canal Street in New Orleans, LA. March 16, 1916: Milwaukee Journal Building in Milwaukee, WI. March 28, 1916: Police halt advertised escape in Times Square, New York, NY. March 29, 1916: Bowling Green subway construction site in Battery Park, New York, NY. April 19, 1916: Munsey Building at Pennsylvania & E. St. in Washington, D.C.
April 26, 1916: The Sun Building on Charles St. in Baltimore, MD. Oct. 18, 1916: Toronto, Canada. Oct. 31, 1916: Erie Canal & Exchange St. in Rochester, NY. Nov. 6, 1916: Post-Sun Building on Liberty Ave. & Wood St. in Pittsburgh, PA.
Nov. 15, 1916: Pickering Building in Cincinnati, OH. Nov. ?, 1916: Citizen's Trust and Savings Building at corner of High & Gay Street in Columbus, OH. Nov. 29, 1916: Roof of County jail in Grand Rapids, MI. Dec. 13, 1916: Daily News Building in Dayton, OH. Dec. 20, 1916: John Harkness Brown Building at 1019 Euclid Ave. at 9th St. in Cleveland, OH. Feb. 27, 1917: B.F. Keith’s Building at Tremont St. in Boston. March 7, 1917: Brownell Building at Exchange Place in Providence, RI. Nov. 5, 1917: Subway construction site in Times Square, New York, NY. May 15, 1918: Inside Madison Square Garden for NYPL War Stamp rally in New York, NY. May ?, 1919: Harbour Apartments in Los Angeles as movie stunt for The Grim Game. Aug. 21, 1920: NYPD Field Day Games at Gravesend Racetrack in Brooklyn, NY. Aug. 28, 1920: Repeats NYPD Field Day Games at Gravesend Racetrack in Brooklyn, NY. Sept. 10, 1921: NYPD Field Day at Gravesend Racetrack in Brooklyn, NY. Dec. 21, 1921: Boston Post Building at Washington & Water streets, Boston, MA. Jan. 5, 1922: Palace Theater at Broadway & 47th St. in New York, NY. Jan. 12, 1922: Albee Building at 15th & G Street in Washington, D.C.
Jan. 18, 1922: Munsey Building in Baltimore, MD. Feb. 17, 1922: 4th floor of City Hall in St. Louis, MO. March 7, 1922: Pittsburgh Post & Sun Building in Pittsburgh, PA.
Oct. 9, 1922: Fyfe Building at Woodward & Grand Circus Park in Detroit, MI. Nov. ?, 1922: Newark, NJ. Feb. 7, 1923: Tribune Building at 4th Street & Marquette Ave in Minneapolis. Feb. 21, 1923: Free Press Building on Carlton St. in Winnipeg, Canada. March 1, 1923: Vancouver Sun Building at Pender & Beatty St. in Vancouver, Canada. March 19, 1923: Hearst Building at 3rd & Market St. in San Francisco, CA. March 27, 1923: Tribune Tower in Oakland, CA. April 4, 1923: Examiner Building in Los Angeles, CA. June 11, 1923: Park Avenue exhibit pavilion at Silver Jubilee Exposition in New York, NY. Sept. 6, 1923: World Herald Building in Omaha, NB. Oct. 24, 1923: The Journal Building in Sioux City, IA. Oct. ?, 1923: Dallas City Hall on Commerce Street in Dallas, TX. Nov. 8, 1923: Chronicle Building in Houston, TX. Nov. 12, 1923: San Antonio City Hall in San Antonio, TX. Nov. 16, 1923: 5th floor of Littlefield Building in Austin, TX. Nov. 22, 1923: Star-Telegram building at Seventh & Taylor in Fort Worth, TX. Nov. 28, 1923: Beacon Building in Wichita, KS. Jan. 23, 1924: State Journal Building on St. Carroll in Madison, WI. Sept. ?, 1924: Providence, RI [unverified]. April 2, 1925: The Indianapolis News Building in Indianapolis, IN. If you know of a suspended straitjacket escape that you don't see here, please shoot me an email or post it in the comments below. When I ultimately produced a printed version of The New Houdini Chronology, listings such as this will appear as an appendix. 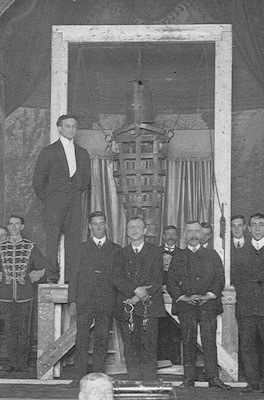 Today I'm sharing a new block of preview years from The New Houdini Chronology: 1906 to 1911. These years chronicle Houdini's continued success in Europe, America, and Australia, and are notable as being his core Challenge years. As a bonus, I've included the massive "A.D." page that tracks the amazing afterlife of Houdini from 1927 to the present. I hope you enjoy this latest look inside The New Houdini Chronology.